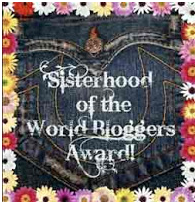 Thank you, Holli, of Holli's Hoots and Hollers for nominating me for an award! This is my first one and I am OVER THE MOON honored. Oh gee, I hope you think these are interesting! 2. I grew up on a farm in a rural part of Arkansas. Our family rode horses and was active in rodeos. My favorite event was steer riding. I still have my spurs and I still have my bull rope! 3. I am in the Benton County Master Gardener program and was the featured gardener for March 2012. 4. As a teenager, I was active in pageants and actually won a couple. 5. I've been the Program Coodinator for the Herb Society of NW Arkansas for three years. 6. I am the proud mother of a United States Marine. 7. This February we will celebrate our 27th Wedding Anniversary! Thanks again to Holli, of Holli's Hoots and Hollers for the nomination! Why thank you! I am honored to be among such great company! Thank you, Marci! What a thrill to be included. And I find those things very interesting! I love your interesting facts! I want to know more about your rodeo days. I see a blog post coming on that!!! Hugs sweet girl!